Electricity: Electrical current is 220-240 volts, 50Hz. 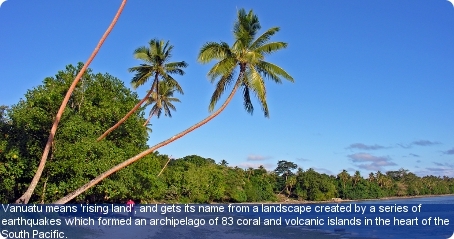 Language: The three official languages of Vanuatu are English, French and Bislama (a pidgin language). Health: Malaria and dengue fever are common. Hepatitis A vaccination is recommended. Medical facilities on the islands are adequate for routine treatment but more serious cases require evacuation to Australia or New Zealand. There have been fatal shark attacks in the island waters and local advice is recommended before swimming. Comprehensive travel health insurance with evacuation cover is strongly recommended. Tipping: Tipping is traditionally unacceptable. Safety: Natural hazards in the form of earthquakes and volcanic eruptions are common. The islands have experienced more than 40 earthquakes in the past two years, some measuring over seven on the Richter scale. The crime rate is low, but precautions against burglary and street crime should be taken, especially at night. Business: Office hours are generally 7.30am to 11.30am, and then 1.30pm to 5pm on weekdays. Communications: The international access code for Vanuatu is +678. The outgoing code is 00 followed by the relevant country code (e.g. 0044 for the United Kingdom). No city codes are required. There is GSM mobile phone coverage of the islands and local pay-as-you-go SIM cards are available from the local network provider, Telecom Vanuatu Limited (TVL). Internet service is available at several Internet cafes across the island. Duty Free: Travellers are not required to pay customs duty on 250 cigarettes or 250 grams tobacco or 50 cigars or 100 cigarillos; 1.5 litres of spirits and 2 litres of wine; 250g of eau de toilette and 10g of perfume; new items up to a value of Vt50,000; personal belongings and sporting goods for personal use.